Being a leading dealer of bullion in North India SB Ornaments PVT. LTD. (SBPL) Enjoys good reputation amongst it's clients as well as suppliers and bankers. 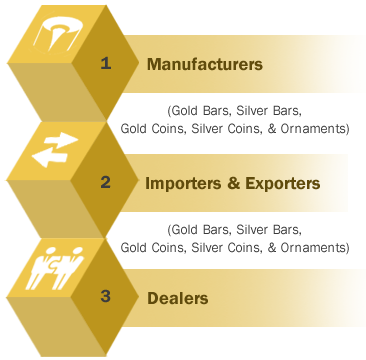 Being a direct Importer & Exporter of bullion we enjoy a strong relationship with all Government Nominated Agencies & banks as well as international suppliers. Continuing to build our success story SB Ornaments PVT. LTD. (SBPL) decided to launch a new unit as SB Bullion to provide wholesale and retail level bullion delivery in the spot and future markets in india. SB Bullion involved purely in trading of bullion is result of our ethical business practices, hard work & dedicated team. SB Bullion has been carved out of SB Ornaments Pvt. Ltd. (SBPL) to provide better services to it's clients and further carry on the business as manufacture, dealers, exporters and importers of ornaments, precious metals and non precious metal in india & outside india. The precious metal includes gold, silver, platinum or any metal or compound which is termed as precious metal on the international or national recognized metal exchange.